#296) @CNXNStory – Join the Twitter Feed for the New Book and App! Time to start cranking up the social media. There’s going to be lots to come. The website is in the works. The book and app are now finished, ready for release in a couple weeks. It’s going to be fun to share with new audiences. Follow our Twitter feed to join in. TIME TO GET YER CNXN ON! Two weeks from tonight. Dorie, Brian and I are putting together a three ring circus like we’ve never done before. There will be games, there will be exercises, there will be stories, there will be improv … and best of all, there’s going to be the new Storymaker App. On Tuesday we did a workshop in L.A. with 25 teachers where we put the app up on the screen and “crowdsourced” a story. It was fun. And it worked. Really well. And everyone wanted a copy of the app. It should be available from the App Store and Google Play within two weeks. We’ll let you know when it’s up. Malcolm Gladwell — popularizer of the 10,000 hour “rule” — has a short essay on the New Yorker website today addressing the “natural born” concept, mostly for chess players, but really for every skill. His conclusion is that there is very little “natural born” element at work. This is sooo relevant to our Connection Storymaking Workshop where we can give you the rules, but not the 10,000 hours. THE GOOD BOOK COMETH: September 9. I cite Gladwell’s 10,000 hour “rule of thumb” repeatedly in relation to how long it will take you to become a great storyteller. We recently had a person at a research institute say to us, “Oh, we’ve already had two or three storytelling workshops here.” As if it’s a, “been there, done that,” issue. Like, “we’ve already nailed the storytelling thing.” Yeah, right. This is what we say with our Connection Storymaking Workshops. We can give you the cerebral part — the basic rules and building blocks. You are going to have to put in the 10,000 hours to develop the visceral part. Which makes sense to me. I started college at the University of Kansas with a bunch of Kansas farm boys — many of whom were unbelievable storytellers — really the best I’ve ever known. They could silence an entire bar of drunks as they would tell tall tales of growing up in the flatlands of Kansas. But those guys started hearing great storytelling as they emerged from the womb. Do the math. 10 hours a day of storytelling makes 3,650 hours a year. By age 3 they were already past their 10,000 hours. Gladwell is right. Probably “not so much” on the natural born thing. People are turning into communication gluttons. A new article says your iPhone now consumes more power than your refrigerator. Our new book is advocating communication that is short, tight, and powerful. Which is one way to fight communication gluttony. 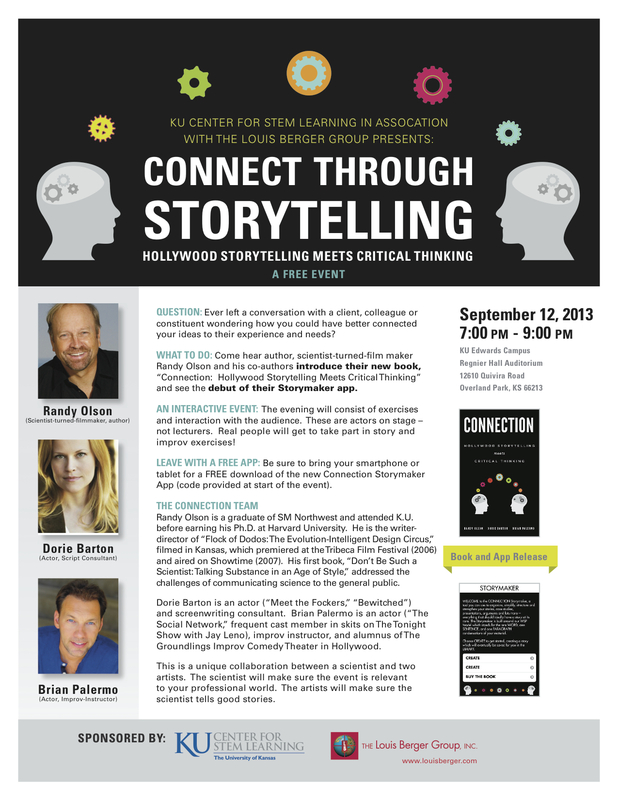 BOOK AND APP LAUNCH EVENT SEPTEMBER 12 IN KC. It’s going to be a whole new world as it will be the first time we run our Connection Storymaking Workshop using our new app. Haven’t you been feeling this for about the past decade? Ever since the advent of blogging it’s felt more and more like people are communicating too much. Not that communication isn’t as important as ever. It’s just that there’s a greater need than ever for communication to be efficient, effective and meaningful. What we’re teaching in our Connection Storymaker Workshop is exactly that — trying to help people tell stories that are narratively tight, and humanly compelling so that less time is wasted. 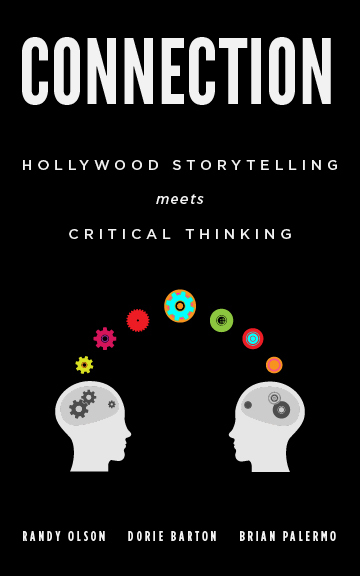 In a world of blah, blah, blah, telling better stories can make things a little less tedious, dull and painful. We’re releasing our new book and app Sept. 9 and will have a big launch event in Kansas City that Thursday evening, September 12 where the three of us are going to put on a show like nothing before. It will be two actors and a director on stage for 1.5 hours filled with audience exercises and games. The following two days we’ll be running workshops with science folks from the high school to college to professional level. It’s going to be fascinating as it will be the first time participants will be able to use our Storymaker app in the workshop for their story development work — which is gonna be exciting! If your blog gets picked by TIME Magazine as one of their Top 25 you get a free trip to my donut shop. You also get to have your mind cracked open by the new world of Youtube that you probably know nothing about. Uber-blogger Andy Revkin was in town to collect on his donuts for being picked by TIME as a Top 25 blogger. I took him on a fascinating visit to Maker Studios, one of the top 3 Youtube production companies that have cropped up in Hollywood. Yesterday I hosted my favorite blogger, Andy Revkin, author of the NY Times blog, Dot Earth. 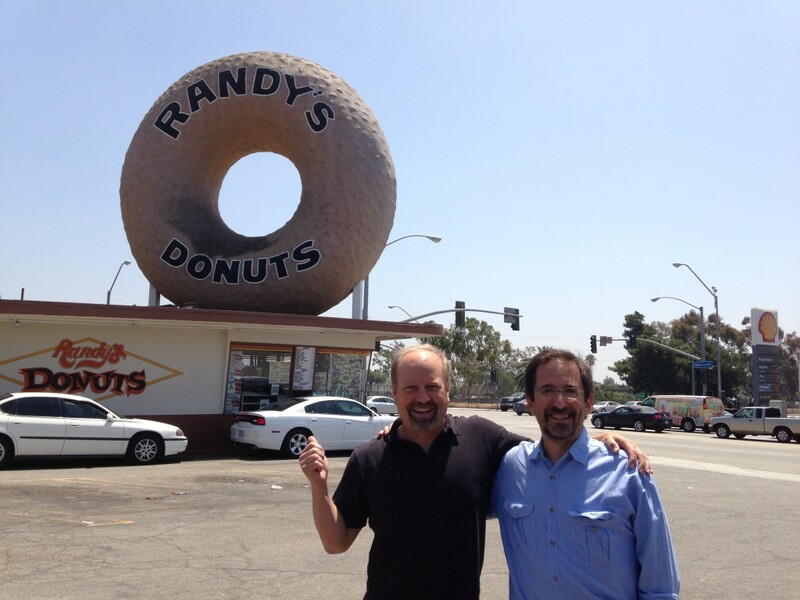 In 20 years of living in L.A. I’ve never stopped by the iconic Randy’s Donuts until yesterday as we were driving past LAX. Long overdue. But much more interesting was the tour we took of Maker Studios. If you’re over 30 you may not want to read this. You may not even want to read it if you’re 25 and not part of this strange new world of Youtube. Welcome to the world you probably know very little about. While all my film school classmates in their mid-40’s are riding the down elevator as the independent feature film world continues to collapse, these kids are rocketing upwards on the up elevator, making money hand over fist, having the time of their lives. So we took the tour — Andy, his 15 year old son (who was the ONLY member of our group who seemed to understand it all because this is HIS world), and my group of 4 co-workers, all somewhat disoriented by the enormity of this entire ecosystem we’re not part of. Our host, who is 25, was incredibly relaxed and gracious. Usually when you get a tour of someone’s production house they are desperately trying to impress you and convince you that they actually are succeeding. There was none of that with this tour. These folks don’t need to impress you — they just ARE succeeding. There was an excellent article last January in The New Yorker, “STREAMING DREAMS: Youtube Turns Pro,” by John Seabrook that forewarned of this explosion. It was fascinating to see up close what he foretold. Not that their content is exactly uplifting the race or saving the planet. But just look at the sheer volume of eyeballs they are playing to. They have several tens of thousands of Youtube Channels that they either run or provide content to. So if you made videos and posted them to your own Youtube channel, what would you consider successful? Maybe 10,000 views? Maybe 100,000? Their most successful channel is called Pewdiepie. It’s just one knucklehead kid in Sweden posting silly videos of him playing video games and providing running commentary. He gets … 170 million views a month. Soak that in for a moment. Look at the trailers for the current hot Hollywood movie, “The Butler,” on Youtube. The most widely watched version has 384,000 views. Every video that Pewdiepie puts up gets 3-5 MILLION views within a week. And there’s an even bigger channel that’s not part of their company called Smosh. It’s content, “is even stupider,” said one of our hosts. So I look at all the great science communication and climate communication workshops being run (by old people) these days and wonder — do they even know about this new Youtube world? #291) “NARRATIVE NEEDS”: Villain Shortage? My “Beware the Simple Storyteller,” essay a couple weeks ago got a nice response. This essay is a follow-up. What do you do when you start to run short of villains? For a perspective, I point to one of the greatest pieces of environmental writing that you’re not likely to ever consider without me pushing it — P.J. O’Rourke’s Rolling Stone essay for Earth Day 1990 making fun of environmentalism. It’s a timeless classic which is mostly about the innate “narrative need” for villains. EVEN BROKEN WATCHES NAIL THEIR PERFORMANCE ONCE IN A WHILE. 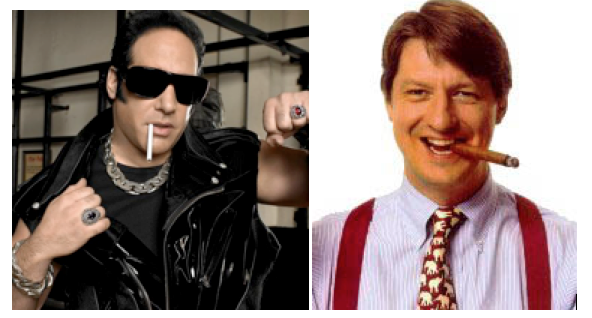 Andrew Dice Clay is currently hitting his moment of alignment with the stars. P.J. O’Rourke did it 23 years ago. Let’s begin by talking about “narrative needs.” We know that humans are, “Storytelling Animals.” Jonathan Gotschall wrote a nice book with this title last year. Our entire culture and daily life is built upon stories. So it’s only logical we would end up with narrative needs. In the same way our body needs carbohydrates, fats and protein, our brain needs the building blocks of stories. This begins with the need for heroes. Given what Hollywood is pumping out these days for blockbuster movies, no one in America would question this need (though try living in Australia — at the start of Chris Vogler’s foundational work, “The Writers Journey,” he talks about how Australians buy into their “tall poppy syndrome” which is anti-heroic, and which I know too well from having lived there several years). The flip side of needing heroes is the need for the villains they oppose (good guys AND bad guys). In the “Beware” essay I talked about Frank Daniel’s simple rule of screenwriting that, “Your story is only as strong as your villain is evil.” Why doesn’t the popular press talk about this dimension as much as they do about heroes? The basic trend is everywhere in our society — from the far right painting President Obama as evil incarnate to the left gong crazy with “Bush Bashing” for the last President. We need villains. So while I’m headed in this essay towards rightwing goofball P.J. O’Rourke, I want to get there via the new Woody Allen movie I just saw a couple nights ago (which is excellent — the Wood Man is 78 and at the top of his game!). Let’s talk about two men who are largely annoying, but like broken watches, every once in a while manage to land right on the money. After a career of being not that funny yet frequently offensive, all of a sudden the Dice Man is about to be a major “contendah” for an Oscar for Best Supporting Actor. If you haven’t seen Woody Allen’s new movie, “Blue Jasmine,” you should see it, not just for the equally Oscar-worthy performance of Cate Blanchett (she’s tremendous), but also for, of all people, Andrew Dice Clay. It’s not like he’s an epic and unforgettable character in the movie — you can only expect so much of a supporting character in a humble Woody Allen film — but you really can’t take your eyes off him. He is indeed that good, unintentionally stealing every scene he’s in. There’s no doubt he’ll get at least an Oscar nomination. So, after a lifetime of embodying male piggedness at its worst, boom, he’s a role model. Of sorts. 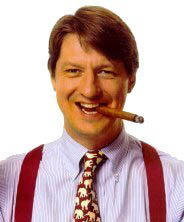 Similarly, I’m no long term fan of conservative author/schnook P.J. O’Rourke, but in 1990 he so thoroughly characterized the mass behavior of the American environmental movement with his Earth Day essay in Rolling Stone (I read it when it originally came out) that I have managed to track down his timeless essay titled, “The Greenhouse Affect” (brilliant title and waaay ahead of its time — and as I say, I may be the only person on the planet who still gives thought to it) in a collection of Rolling Stone environmental essays. This is the key quote in O’Rourke’s brief 7 page essay. He, of course, has lots of silliness to go along with it, but buried in his nonsense is this very penetrating quote from “The True Believer,” by Eric Hoffer. And this is where I’m picking up on what I had to say about the vilification campaigns against processed foods (the followers of Michael Pollan) and fracking (the followers of Josh Fox). They are both tapping in to this unifying, blinding force of hatred. He quotes Hoffer further saying, “Mass movements can rise and spread without a belief in God, but never without a belief in a devil.” This is yet another simple, fundamental rule that everyone should keep in mind as you listen to these campaigns of rage being conducted in a relatively healthy and spoiled society. Great essay. And similar to what he says, I get uncomfortable when I start hearing too many people feel like they’ve figured out, “the devil in our society.” It’s just all too complex these days. It’s like the Gulf oil spill. No sooner did it happen than news began to trickle out that The Nature Conservancy had earlier accepted $10 million from BP Oil Company and many other conservation groups had also accepted their hand outs, making it difficult for them to grab the moral high ground. So what do you do when you start to run out of villains? Hollywood has dealt with this problem for decades as we end up no longer hating certain countries. Who are you allowed to vilify? In a decent world the answer is obvious — you put more effort into telling stories that are both powerful AND accurate. It is possible, even in a world of fewer villains, to do this — to tell compelling stories that are still honest. But it takes harder work. And a willingness to just stick to the truth and accept the financial shortfalls when the public doesn’t go wild over your film because you foolishly told the truth (rather than just Ben Affleck’s “the spirit of the truth”). Again, for processed foods, fracking, over-fishing, vaccinations, chemical preservatives, and countless other complex issues these days the answer just isn’t that simple. The only hope for dealing with all this complexity is better and more conscientious communicators who can find the stories that are both accurate and powerful. #290) Google and Inhofe, sittin’ in a tree, kay-aye-ess-ess-aye-en-gee! This is just about comical. The firm that is supposed to stand for information and innovation is supporting Grandpa Inhofe who has stood for climate cluelessness and Ludditism? 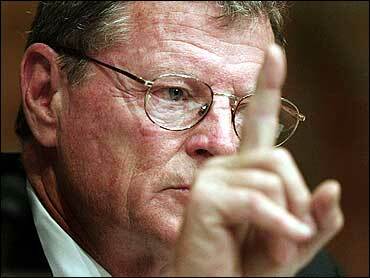 Senator James Inhofe points to the least of his concerns these days — the atmosphere. Google’s motto is, “Don’t Be Evil.” A lot of climate folks lately feel they are going against their own beliefs. I have a tiny feeling of connection with this issue since I interviewed Marc Morano in 2007 (for my movie, “Sizzle: A Global Warming Comedy“) when he was the spokesman for Senator James Inhofe of Oklahoma who has led the Senate efforts for more than a decade to stop all climate action. Now a group of 17 Google Science Fellows have written a letter of protest (and Andy Revkin has helped call attention to their efforts) to Google boss Larry Page, asking why Google supported a July 11 fund-raiser for Inhofe. They’ve couched their argument in diplomatic language. I would have just sent a giant “WTF?” memo with a bunch of, “What in the world are you thinking, Google?” type comments. Inhofe seems like a nice guy on a social level — kind of grandfatherly in his demeanor (a lot like climate skeptic patron saint Fred Singer). But he’s been a voice for the very worst attacks on climate science and scientists — especially Mike Mann whom I interviewed back at the start of the Benshi. While I argue for the value of argumentation as an opportunity for broad education, there are limits. Inhofe is simply the kind of American knucklehead you end up having to apologize to the planet for (as I felt the need to do in Norway a couple years ago) — not so much whether he’s right or wrong on climate, but just because of the complete disrespect he shows for the academic world and the entire idea of using brains to make the world a better place.